Jimmy Kirby, Jr. is currently engaged in his endeavor towards a Doctoral degree as a student in the Department of Africology and African American Studies at Temple University. His research interests include African world history, and Africana cultural aesthetics. Kirby sees himself as a spiritual architect with an uncanny ability to access the basic goodness in people. Mr. Kirby is a devoted husband, loving father, and dedicated advocate for the discipline of Africana Studies. His engaging attitude helps him to attract positive circumstances and to make good connections. 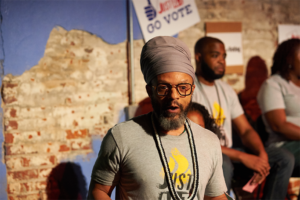 As a member of the Just Act ensemble, Kirby describes himself as “possessed” by the unlimited potentiality for individual growth and development as well as collective transformation rooted in Theatre of the Oppressed. So much so that for Kirby Just Act is a self-fulfilling prophecy—a driving force in the evolution of his soul’s purpose—to serve humanity to his highest human potential.